Saturday I was in the gym and I noticed my phone had the blinking red light indicating a message. 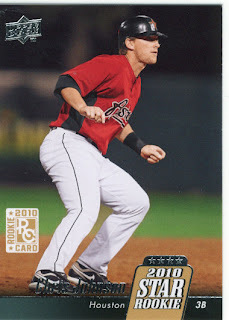 It was an e-mail from Dave over at the Baseball Card Store saying they opened a pack of 2010 UD and decided not to leave it out because I would want it and to stop by when I had time. We all know what happened next. I finished up my workout, grabbed a shake, and hit the road for the card store. You can't send me an e-mail like that and expect me to not run there immediately. I have no patience, and no will-power. I hauled tail to Jersey and no one was surprised that I was there so fast. Dave throws me the pack and I flip through them somewhat slowly to enjoy whatever I was going to find. I have to say this is the most hilarious card I have seen. 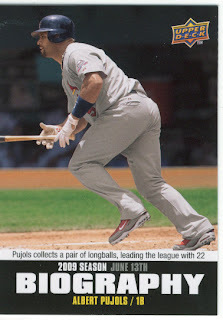 I might even like it better than the Pujols card. It is perforated down the middle for separation but I'm leaving it intact. 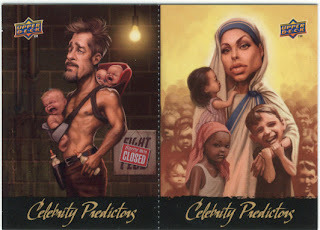 Awesome card. They could really make a whole set of these caricatures but as baseball players, I think they are fun. 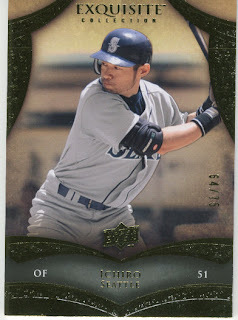 Ichiro 2010 Exquisite serial numbered /75. These cards are super thick and very nice if you ask me. I may make a trip to the shop after class since I am anticipating being snowed in tomorrow I will need something to keep me occupied. Oh and I will need something to blog about, which is always a great excuse right? They are inserting Exquisite into (hobby) packs? Yeah, across all the brands I think. See, all my Astros are going to you! Awesome - especially the Ichiro! 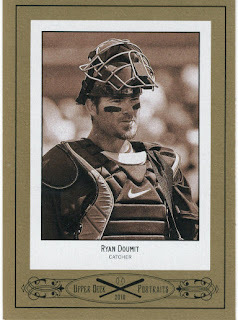 So what do you like better - 2010 Topps or UD? 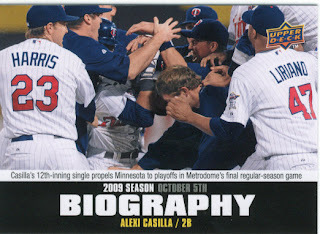 I was at that Twins game (big shocker, I know). That was an incredible freakin' game. BTW. The word verification for me today is "diotbars." Are you ladies trying to tell me something? !